I only just discovered that cavolo nero was also called dinosaur kale, which makes me want to eat it 100 times more because I freaking love dinosaurs. I was so excited to find it in Morrisons that I did an actual out loud 'ooooooohhh'. So with most vegetables I impulse buy, it sat in my fridge for a bit until I decided what to do with it. In the end I decided it would be the perfect addition to macaroni cheese. 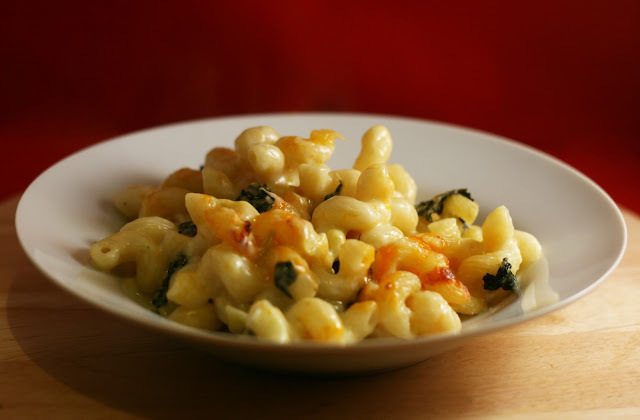 If you've been reading this blog for a while, you'll realise that this is very similar to my green mac and cheese recipe, except that I wasn't lazy and made it from scratch. I definitely recommend making it from scratch, it's just as easy and tastes about 1000% better. This recipe makes enough for 2 + left overs for lunch the next day (unless you have a horrible boyfriend who eats it while your back is turned). Pre heat the oven to 200 degreess, then put cavolo nero into a steamer and set the timer for 20 minutes. Halfway through cooking add the leeks to the cavolo nero and start boiling the pasta, when the timer is up drain the pasta and vegetables and set to one side. Make the cheese sauce by melting the butter in a pan, then mix in the flour to make a roux. Slowly add the milk and keep whisking over a low heat until it thickens. Once nice and thick add 100g of the grated cheese and whisk in until it is all melted in. Put the vegetables and pasta in to a medium sized pasta dish and mix in the cheese sauce. 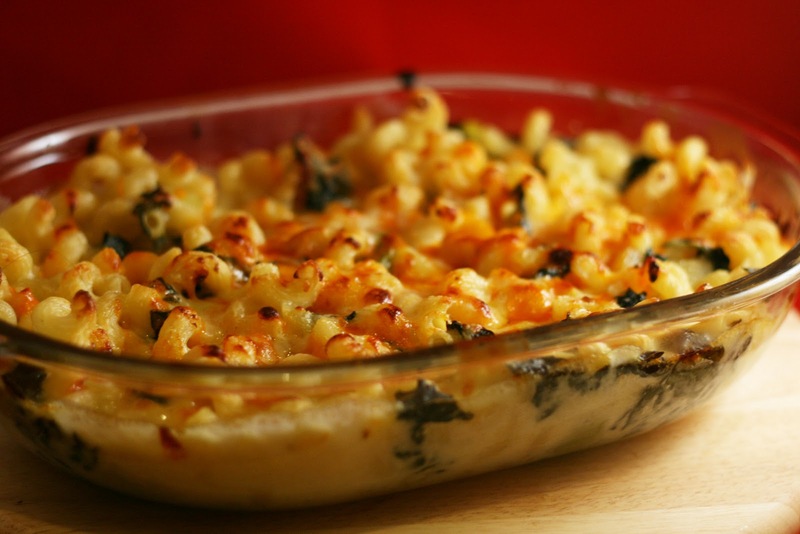 Top with the remaining grated cheese and pop in the oven for 25 minutes. When it's all crispy on the top and bubbling it's ready! Enjoy! Ahhhh, this sounds so cool! Love any excuse for dinosaur kale - although I always call it cavolo nero. It is my favourite green and I have loads of recipes (probably too many) for it on my blog, including the one I just posted. I haven't put it in mac and cheese so will do as you suggest, esp to cut through cheesey unctuousness. You must have a posh Morrisons cos I've never seen it in mine. Always get mine from farm shop or Waitrose. Probs lots cheaper at Morrisons.